Are federal agents trying to interfere with a state medical cannabis effort despite President Trump’s pledge to respect local marijuana policies? 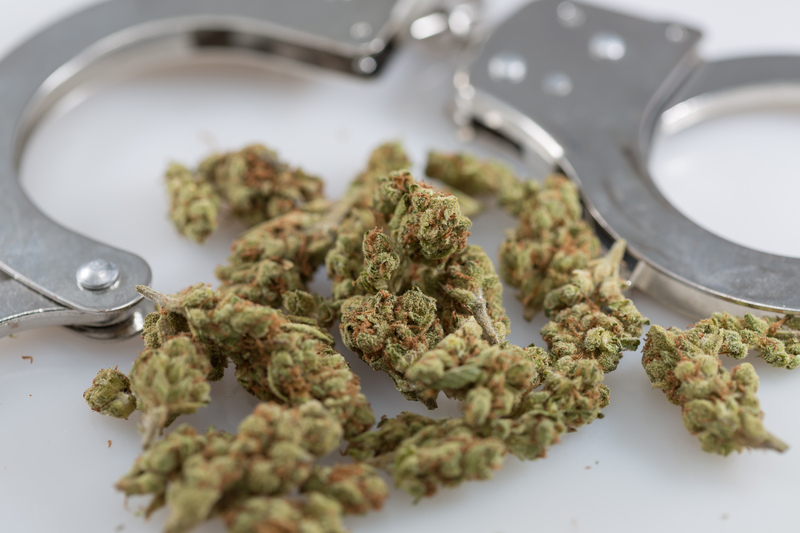 New public documents show that a U.S. Drug Enforcement Administration (DEA) task force is officially affiliated with a group that’s doing everything it can to derail a proposed Utah initiative to legalize medical marijuana. Drug Safe Utah, an organization representing opponents of the initiative such as the Utah Medical Association and the DEA Salt Lake City Metro Narcotics Task Force, is actively recruiting paid canvassers to encourage voters who signed the cannabis ballot petition to rescind their signatures. The Salt Lake Tribune first reported the DEA task force’s affiliation on Thursday. Last month, organizers behind the proposed Utah medical cannabis initiative met two key requirements to qualify the measure’s inclusion on the state ballot in November: They collected received more than 113,000 total signatures and exceeded the signature threshold in more than 26 of the state’s 29 Senate districts, according to county clerks. Days later, Sen. Orrin Hatch (R-UT), who recently came out in support of medial cannabis access and research, met with representatives from the Utah Medical Association. The discussion centered on “medical marijuana research, puns, and finding real alternatives to addictive opioids,” according to a tweet from Hatch’s official account. Drug Safe Utah’s primary officer, Michelle McOmber, is also the CEO of the Utah Medical Association. The DEA task force was not immediately available to comment on the nature of its involvement in the anti-legalization group, but it is listed as “an organization affiliated with the [political issues committee]” in a statement of organization filed on April 27. The apparent endorsement of an anti-legalization group by the DEA comes at a time when the executive branch is moving in the opposite direction, with President Donald Trump pledging to back congressional efforts to protect states where marijuana is legal. The president has also repeatedly said that he supports medical marijuana “100 percent” and knows people who have benefitted from it. It’s unclear whether DEA affiliation with a political campaign to block medical marijuana legalization amounts to a violation of the Hatch Act, which prohibits certain types of partisan political activity by federal employees. “I believe that in general, it does not reach ballot initiatives that aren’t associated with a party,” she said. However, she expressed uncertainty over the involvement of a federal agency in state-level ballot initiatives, and questioned whether the 1986 Anti-Drug Abuse Act, which formally established the DEA’s task force program, permits this type of activity. Marijuana Moment reached out to the Justice Department for clarification, but it did not respond by the time of publication. Drug Safe Utah also did not acknowledge requests for comment. UPDATE 5/7/2018 8:48am PST: A spokesperson for the Utah Medical Association reportedly denied providing paid canvassers with the script featured above, according to a journalist from local radio station KUER. Marijuana Moment has still not received comment from Drug Safe Utah. 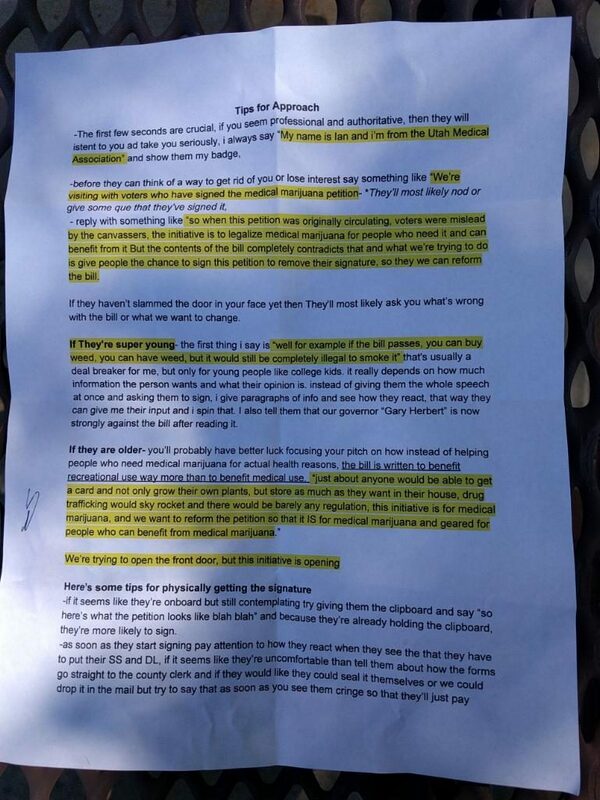 UPDATE 5/7/2018 2:29pm PST: Video obtained by the pro-legalization advocacy group TRUCE Utah appears to show a canvasser making a series of false or misleading claims about the medical marijuana initiative in an effort to get the signee to remove her signature. A spokesperson for the Utah Medical Association, the main backer behind an effort to get signatures off the petition, told Fox13 that the organization “doubts seriously that the video is one of our people,” but added that UMA does not have “any control” over who is hired or trained by a third-party firm UMA hired to orchestrate the anti-legalization campaign. Does Bernie Sanders Support Legalizing All Drugs?